Have you seen UGA’s new TV spot? After the boatloads of shame that were cast upon the school from last year’s ad, some Grady alumni decided to create a better video. It features the famous Chapel Bell and a song from R.E.M. The B-52s’ first live album drops Oct. 11. With the Wild Crowd – Live in Athens, GA was recorded and filmed at the Classic Center earlier this year. A friend of ours, Tim White, recently lost pretty much everything last week in a fire at his home. His buddy and bandmate John Keane has set up a facebook event to take donations. It details what is needed so if you’ve got some extra stuff, contact John. Thanks. 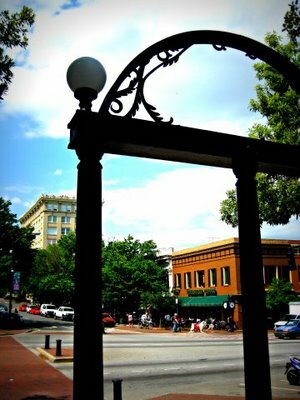 Athens, GA circa 1985 via PARTYLINE, the show. Tonight Zaxby’s is donating 10% of their sales between 5pm & 8pm to help support the Georgia Theatre All Athens locations are participating. A Kate Bush cover by Bambara! Gigworn: Final Sale: 90% off everything. Get to it!